Many people asked themselves if the rail shooting genre was a solid possibility during the 16-bit video game era. By solid I mean something fluid and dynamic, an experience that should get close to the likes of what people were seeing in the arcades at the time. Unfortunately the high expectations brought by the release of the Mega Drive weren't met by launch titles such as Super Thunder Blade and Space Harrier II, so the task of putting away that lukewarm impression was left for later releases. Originally released in 1988 and known in the arcades as the ultimate space adventure, the game represented the apex of the super scaling technology pioneered by Sega, with heavy sprite manipulation conveying the sensation of flying through outer space in all sorts of alien landscapes. 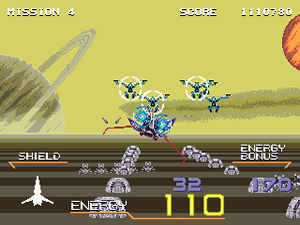 Unlike the abovementioned titles, which were in fact pseudo-sequels with new gameplay elements, on the Mega Drive Galaxy Force II was supposed to be a straight port of the arcade. However, even when you consider the explicit differences in hardware, what Sega fans got at home with the 16-bit cartridge was a veritable disappointment, and for many people nothing more than a nearly unplayable disaster. Defending the "jewel of the galaxy"
There is a very clear reason for the widespread backlash this game gets. It's a simple matter of realizing that the programmers could've done a much better porting job instead of delivering a watered down conversion renowned by its blocky graphics and sluggish controls. And yet, against all odds, here I am writing about it because I have plodded my way through all of that to beat the game. Mind you, since there are no continues of any kind it's impossible to beat Galaxy Force II on the Mega Drive without clearing it on one credit. As an integral part of the Galaxy Force, the player pilots an elite starfighter with the mission to stop the evil Fourth Empire from overtaking the federation star systems. The journey can start in any of the five planets that have already been conquered by the bad guys, ending in a sixth area where you propel through hyperspace directly into the enemy's core. Either flying in open outer space or over the surface of the planet, in each one you'll be entering one or more tunnels filled with enemies, obstacles and trajectory turns. By default, controls work with B for missiles, A for speed down and C for speed up, with automatic single-shot firing. Button B is supposed to be used mostly when you have locked onto one or more enemies, and while the in-stage power-up remains active (it connects to the ship automatically) the number of simultaneous lock-ons is increased. Lives are replaced by a fuel counter that starts with 1200 points and goes down pretty fast. Getting hit by bullets or flying into walls and obstacles makes it deplete even faster. Recovering fuel happens in only two occasions: when you come out of a tunnel or when you reach the end of the level. In both instances you'll cash in the energy bonus points from all the enemies you were able to destroy. However, that isn't enough for players to reach the end of the mission... Just like in the arcade game it's necessary to fly fast or eventually you'll run out of fuel, no matter how perfectly you play and how many targets you kill. Even though the game doesn't do anything blatantly wrong (lousy hit detection, some flicker and a finnicky lock-on scheme notwithstanding), going straight from the arcade game to the Mega Drive port can be a shock due to the frame rate differences. Simplifying graphics and doing away with textures should've left some room for the so-called blast processing to do its magic, but in Galaxy Force II it just didn't happen. On my part I always wondered how awesome it would've been had it been given the same dynamic treatment of the After Burner II port, for example. At least Galaxy Force II isn't an impossible task in its default settings. It's only a matter of abiding by the game's rules and eventually learning how to get around the trickiest areas. Tips: identify the enemies that don't shoot and kill them all; in several areas it's better to fly low and destroy as many ground enemies as possible (a few tunnel sections and much of the missile lines in the starting stretch of level 3); more fuel can be recovered by killing bigger enemies (flame snakes in stage 2, the mechanized serpents in stage 5); when inside the tunnels full of rocks of level 5 tap up a little and move left or right only when needed. Lastly, don't be frightened by the "shield broken" message you get as soon as the ship takes a predetermined number of hits. The manual says that from then on each hit should eat a bigger chunk of fuel but in my opinion that's pretty negligible. When you get that weird feeling that you're still having fun with a game like this it's necessary to pinpoint where it's coming from. In this case the answer is easy: the soundtrack. The foundation was already there in the arcade original, but there's no denying that the Mega Drive music does wonders for the game's general appreciation. My high score on full defaults is below (Normal difficulty, Normal energy timer, Strong shield strength). Besides these available tweaks to the main game, vertical controls can also be inverted if you so wish. It's interesting watching this, if I remember correctly, the Master System version was quite a good conversion. I think me and my friends had heaps of fun on that one. Gotta try that one. Galaxy Force and Space Harrier! On a side note, I'm back into shmups and still love reading your posts. Update on my brother, the original arcade version of '1942' basically made him quit for a while. Now I've got him competing with me to see who gets a 1cc first on 'Eliminate Down'. Every time I start a shmup it's mandatory to check your thoughts on it and since the Megadrive is my weapon of choice you've totally got it covered. How's your log looking? Think you'll ever get through it? One series of games I've never tried and I know you've heard of is Touhou. Ever play those? Good to know my blog notes are being of some use, Justin, thanks for the feedback. 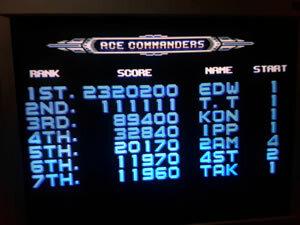 Your brother isn't the only one regarding arcade 1942, that game is pure evil and would make anyone quit (I know I did). Now Eliminate Down is a completely different story, I'm willing to bet you have both beaten it by now. As for the log, I'm at least beating more games than I'm buying, that's a good measure I guess. :) I don't intend to venture into Touhou anytime soon, simply because PC gaming just isn't my thing. Perhaps in the future, who knows?